Registration is now open for the Thailand National Championships 2013, to be held in the Queen Sirikit National Convention Centre, 1-2-3 and 9-10 November 2013. 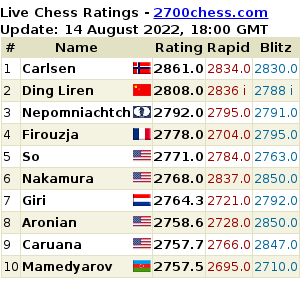 The tournament is FIDE rated 9-round Swiss. Click here to register (Thai nationals only). The tournament is organised by the Thailand Chess Association, and sponsored by drinks manufacturer ThaiBev. In addition to the National Championships, there is an Expat Challenge tournament for foreigners resident in Thailand, running on 2-3 and 9-10 November, 7-rounds Swiss, also FIDE rated. Click here to register. All participants must be registered with FIDE – contact your country’s rating office for details.